The primary purpose of the Oregon Bioscience Association (Oregon Bio), a 501(c)(6) nonprofit member trade association, is to promote the growth and quality of the bioscience industry through: Advocacy, Cultivation and Education. As part of this mission, we are poised to deliver a calendar of innovative and informative events through 2018 that meet the needs of our members with a renewed focus on current trends. To stay on pace with Oregon’s ever-changing and exciting bioscience landscape, we devised a refreshed strategy that enabled Oregon Bio to engage industry throughout the state. Last year we presented “of-the-moment” topics including diversity in the workforce, the impacts and opportunities of the 21st Century Cures Act and upcoming biotechnology at the Company Pitch Showcase, which were paired with our popular “Bio On” networking events. We design our events to support your business and the bioscience ecosystem. 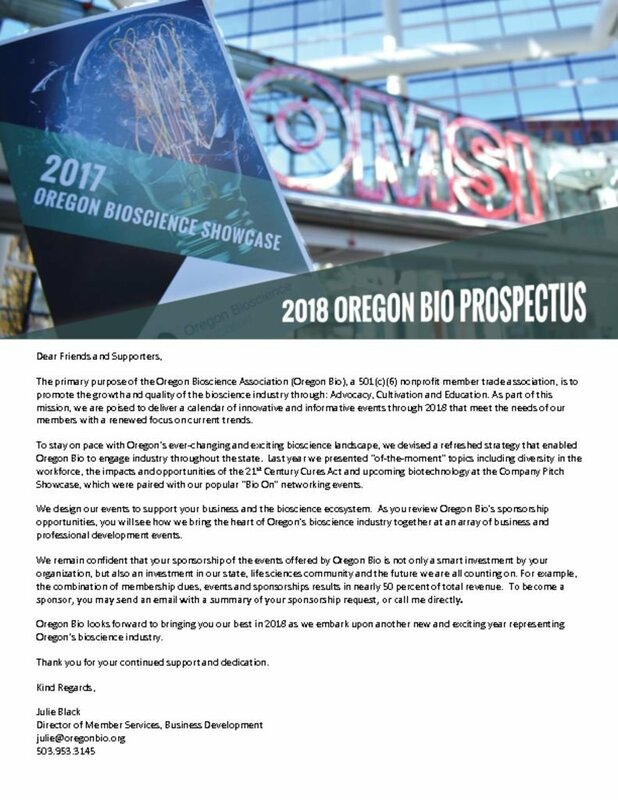 As you review Oregon Bio’s sponsorship opportunities, you will see how we bring the heart of Oregon’s bioscience industry together at an array of business and professional development events. We remain confident that your sponsorship of the events offered by Oregon Bio is not only a smart investment by your organization, but also an investment in our state, life sciences community and the future we are all counting on. For example, the combination of membership dues, events and sponsorships results in nearly 50 percent of total revenue. To become a sponsor, please send an email with a summary of your sponsorship request. Oregon Bio looks forward to bringing you our best in 2018 as we embark upon another new and exciting year representing Oregon’s bioscience industry. For more information about premium membership and sponsorship opportunities, download the Oregon Bio Prospectus. Please note that event sponsorships are subject to availability.